Stage IV lung cancer blogger Tori Tomalia, a mother with young children, gave a great speech at a lung cancer event yesterday. She posted the speech on her blog, and gave me permission to repost the text below. Inspiring! I almost titled this post “Sharing My Story,” but realized that this is much bigger than me. Today I had the honor of speaking at the Peter A. Kaylor Lung Cancer Walk in Allegan, Michigan. 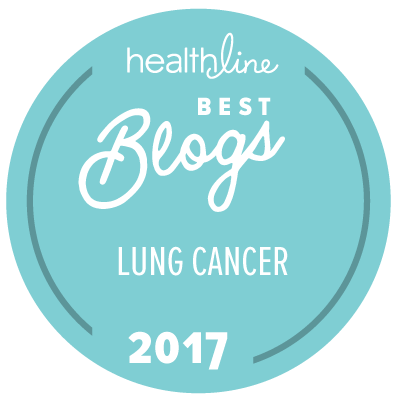 I know how lucky I am to be able to speak out about this disease, when so many others who have gone before me are no longer able to do so.This was what I had to say about my one year, four months, and five days (so far) of living with lung cancer. It started with a cough that wouldn’t go away. But everybody I knew had a cold, so it didn’t seem like a big deal. I started to feel a little better, but before long I had another chest cold. And I was exhausted, but I was in grad school full time, working, and raising a 4 year old and infant twins. Who wouldn’t be exhausted?!? But my breathing kept getting worse, so the doctor thought it was a return of my childhood asthma. We tried one medication, then another, then another. But I kept getting worse. Finally, in May of 2013 they sent me for a chest CT scan to see if there was something else going on. There was. The scan revealed a large mass in my left lung, that had wrapped all around and had caused my lung to partially collapse. A biopsy confirmed that it was lung cancer, and further testing showed that the cancer had spread to the other lung, my spine, my hip, my ribs, my shoulder blade, and my liver. I was unequivocally stage IV, inoperable, at age 37. At that time, I thought it was impossible for a nonsmoker to get lung cancer. Clearly, I was very wrong. So I began 4 months of chemotherapy. July, August, September, October, I struggled with side effects and tried to spend as much time with my family as humanly possible, to “make memories” as my social worker advised. I got to see my little girls learn to ride tricycles, and I got to see my son start kindergarten. The amazing thing was that as the summer progressed, my breathing started getting better. I was able to climb upstairs and kiss my son goodnight again. I was able to walk around carrying my little girls. And then the scans confirmed it: the chemo was working, and my cancer was shrinking. But as October rolled around, a question loomed: what next? The cancer was shrinking, but not gone, and a person can only tolerate so much chemo before the toxic side effects become too damaging. We discussed what they call “maintenance” chemo, a lower dose of chemo that they can give for as long as the patient can tolerate it, to try and keep the cancer at bay. Meanwhile, the shock of having stage IV cancer was starting to wear off, and my thirst for knowledge had kicked back in. I started reading about personalized medicine, where they can test the tumor and figure out what went wrong to cause the cancer, called the cancer “driver.” My oncologist had tested me for two common ones, but my obsessive reading and research revealed that there are several other rare ones that can be tested for. I asked my oncologist for further testing and on October 31 – Halloween – I got the wonderful, game changing news that we had discovered what went wrong to cause my cancer, and that there is a drug to treat it. In November, I started on a brand new drug called Xalkori. I have been taking this medicine – two pills a day – for 11 months, and currently I have no evidence of active cancer anywhere in my body. But I know the battle isn’t over. My wonder drug is amazing, and I am thankful for the good quality of life I have now. I still have side effects, but they are not as bad as chemo. However, I know that my cancer will eventually become resistant to this treatment, that my cancer will figure out a way around my super drug. If/when that time comes, I will pursue other treatments, plans B, C, D, and so on. I have stage IV cancer, I will always be in treatment. To say that this past year has been life-changing is quite an understatement. I certainly appreciate things more than I used to, and I think I have gotten even bolder and more outspoken than I used to be, if that is possible. And I have connected with a whole lung cancer community full of incredibly strong and wonderful people, who I now consider my “lung cancer family.” Sadly, I have learned that this disease can strike absolutely anybody. The thing we all have in common is that we were all diagnosed at stage IV. Stage IV. The other thing we all have in common? None of us deserved this. Lung cancer is the second leading cause of all deaths in the US. Lung cancer kills almost 2x as many women as breast cancer and 3x as many men as prostate cancer. Lung cancer in never smokers is 6th leading cause of US cancer deaths. And yet, I chose to remain hopeful. I know that I am one of the lucky ones. Things are changing fast in cancer research. If I would have gotten this a few years earlier, I probably wouldn’t be here today. If I hadn’t pushed to get more testing done on my tumor, I might not be here today. Chalk it up to stubbornness, perseverance, or just dumb luck, I am very thankful to be here talking to you today. I am alive because of research. There are some really exciting discoveries going on out there and some amazing things coming down the pike. My goal is to stick around long enough to see them. This entry was posted in Advocacy, Guest Blog, Lung Cancer, Public Speaking. Bookmark the permalink. One fabulous, inspirational, experience thus far. I wish you continued positive progress. I am jubilant to hear of your NED! Thank you for sharing your journey, there will be many options in the near future! Blessings to you! Thank you for sharing this, Janet. And I am so flattered that you called me inspiring! A great compliment coming from someone who inspires me! I had the great pleasure of meeting Tori in Boston. I am so happy she gave this speech and highlighted the fact that lung cancer does not discriminate by age or lifestyle.